Before you begin – note this process can be a bit complex and should not be required except in exceptional situations. It is only required if you wish to change the frequency of your email notice settings from the defaults of daily for all forums and topics, except Ride Cancellations, which defaults to Immediate notification. We recommend staying with the default settings. If you are trying to unsubscribe to all emails or a specific forum or topic we recommend using the unsubscribe button in the forum or in the email notices you receive. This is much easier than updating the settings in your profile. Log into the WWBC site. Click the View profile link at the top of the page. Click the Email subscriptions link to see your current subscription settings. Then click the Edit profile button in order to make any changes to your subscription settings. You will see the following page and now you can check or uncheck the type of mails you want to receive. Event notifications – these are automatic event email announcements (sent to people not yet registered) and event reminders (sent to registered attendees only). Forum subscriptions – will only appear if a member has already subscribed to any forum updates. 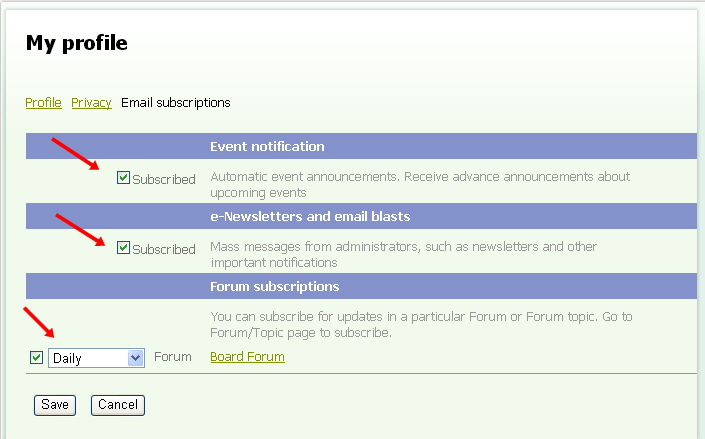 Forum subscriptions and specific topic subscriptions will both be shown and their notification frequency can be changed. You can also deactivate email notifications by unchecking the checkbox for the forum/topic. New members will have event notifications and email blasts turned on by default. Note about the frequency of email notifications – The default for all subscriptions is for a daily digest of any activity. But you have the option of changing any subscription to Immediate or a Weekly summary. After you have made your choices, click the Save button at the bottom of the page.